Unique-ARs free floating hand guards are built on this principle: High Performance Parts, Unique Designs. Our free float hand guards are built to perform while providing an aesthetic design that will make your AR-15 or M4 stand out. Our proprietary free float forends are precision machined to provide a rock steady platform that securely and accurately index’s all your rail attachments. Our free float tubes are for those that demand more, they are made in the USA, tested to perform and come with a lifetime warranty. Turn your AR into art today, make it your own. 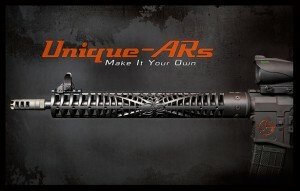 We can use your favorite logo, tattoo, saying, insignia, or wild idea to turn your AR into ART. I first saw Unique-ARs hand guards at one of my local gun shops (OC Firearms) and I immediately had to play around with one. Plastic and composite hand guards have never really appealed to me and I’ve always hated the feel of the quad-rail guards. But, I do like the round-tube styles out there. I’ve seen plenty with various patterns cut into them, but never quite like these. Unique-ARs off-the-shelf designs are bold to say the least and are built to last. They provide a solid and aesthetically pleasing platform free of clutter that is comfortable to grip with or without gloves. Installing the hand guard is easy – the box included instructions and there is an installation video hosted on YouTube and embedded above. 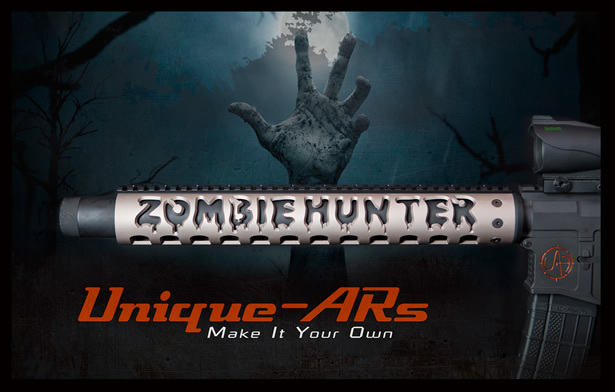 As with most free-float hand guards, Unique-ARs uses a proprietary barrel-nut mounting system that is provided with each hand guard. They have models available for both AR-15 and AR-10 platforms. 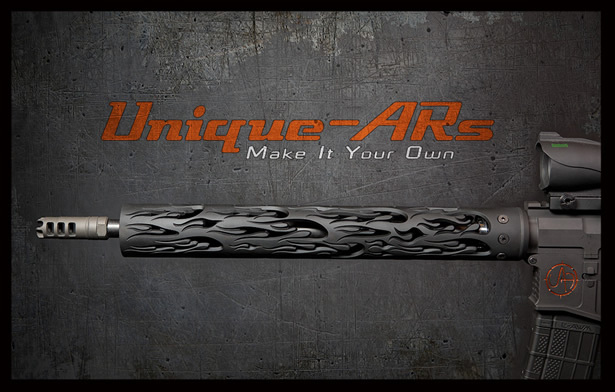 All Unique-ARs products are American-made and covered with a limited lifetime warranty. The stock hand guards range from $175 to $275, depending on the design. 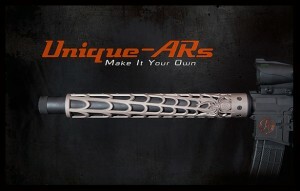 Unique-ARs hand guards are constructed with 6061 t6 aluminum with an exterior diameter of 2 inches and an interior diameter of 1.75 inches. Standard lengths include 7″,9″,12″ and 15″, but they can make any custom length that you require. The tubes are pre-drilled and tapped to accommodate sections of their proprietary Picattiny rail system that can be added just where you need them to mount all of your accessories. They are available in the following lengths: 2.2″, 4.5″, 6.5″, 8.5″, 11.5″ and 14.5″. Each rail is made from 6061 aluminum with a hard coat anodized matte black finish and include all necessary mounting hardware. Unique-ARs offers complete customizability, you are only limited by your creativity. The standard colors include Cerakote Armor black and black anodized, but you can opt for most any color Cerakote has available for just $35 more. Unique-ARs can also accommodate custom one-off projects and group designs/buys, in addition to private label options available for OEMs. …And if your AirSoft gun has a standard mil spec threaded upper (1.250″ x 18 tpi) which many do, the Unique-ARs hand guards will likely fit nicely. Given the popularity of the AR-platform, enthusiasts have been given access to a somewhat endless array of components and accessories. With so many options available, building a firearm from the ground up based on the AR-platform allows enthusiasts a high degree of customization, individuality and plain old fun. 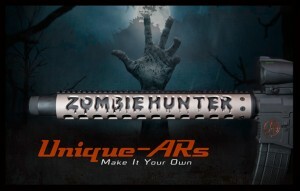 Unique-ARs free float hand guards make it easy for builders to turn their ARs into one-of-a-kind creations without sacrificing on quality or functionality. I was immediately drawn to the high-level of quality and aesthetic appeal of their rails, barrel-nuts and hand guards. For me, the look ‘n feel of the web model did me in. So much so that I am planning a build just to give one a permanent home. 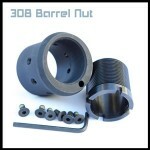 My only real objection is that I could not find anywhere on their site to purchase barrel-nuts alone. Visit Unique-ARs at http://unique-ars.com and on Facebook at https://www.facebook.com/UniqueARs. Unique-ARs is dedicated to helping you build the most Unique AR-15 on the planet. From mild to wild they can turn your dreams into cold hard steel, or brightly colored aluminum. 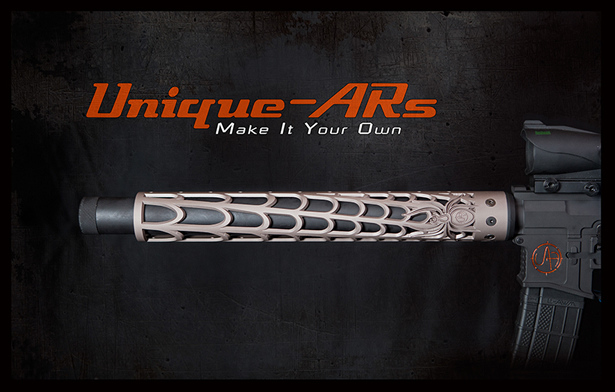 Choose one of our stock forends add custom colors, or have them fabricate a completely custom hand guard for you. 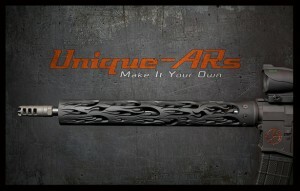 Unique-ARs is a family owned company with a passion for the unique and artistic side of machining. Their dedication to perfection drives them to produce machinery that anyone would be proud to own. As Outdoorsmen they love shooting, hunting, fishing, hiking and snowmobiling. The Unique-ARs global headquarters is based in McCall, Idaho.